the activities exhibited by a human body and other organisms are regulated by a biological clock that is encoded in genes. When there are no clues available from the external world (such as sunrise and sunset), the biological clock enables the body to count time in units of 24 hours. The time period of this clock may not be necessarily 24 hours and hence it is called 'circadian' rhythm. The term is based on the Latin word that means 'approximately'. Under normal circumstances, circadian clock matches with the onset of light and darkness. 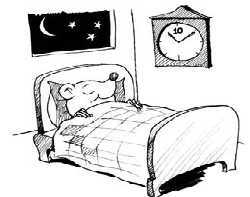 If the circadian rhythm has roughly the same periodicity as the 24-hour clock, it becomes difficult to differentiate whether the body regulates its activities on the basis of an internal clock or an externally perceived objective passage of time. Researchers at the University of Virginia, usa, conducted a study on a strain of mutant hamsters. It was noted that the functioning of a 'clock gene' was deranged as the period of endogenous rhythm was 20 hours instead of the normal 24 hours (Journal of Physiology, Vol 501, No 2). Sixty four male hamsters were kept for few weeks in total darkness. Half of these were wild-type and the other mutant. The researchers fitted running wheels inside the cages and recorded the rotation of wheels. To estimate the energy consumption of these animals in the absence of physical activity, the animals were kept in cages without wheels. Then the researchers measured oxygen concentration in the air going in and out of the cages. Under conditions of complete darkness, the wild-type hamsters displayed an activity rhythm with a period of 24.08 hours. This indicates that they 'woke up' every 24.08 hours, and displayed the expected circadian rhythm. The average period of the rhythm was 20.39 hours for the mutants. The duration of running wheel activity was 9.73 hours for the wild-type and 8.57 hours for mutants. This suggests that the mutant may be exercising less than the wild-type. Oxygen consumption mea surements made in the absence of activity showed that whereas energy expenditure per unit of real time was similar in both animals, it was significantly smaller in the mutants when measured on a per cycle basis. As far as energy expenditure is concerned, the researchers say the living system is concerned with maintaining a balance on a conventional time basis rather than on circadian clock time. It shows if the body has to interact with the external world, it carries out its activities also on the basis of time as measured by physical processes in the external world. Having a 20-hour endogenous rhythm does not mean that the normal 24-hour day is compressed into 20 hours. But then, if internal processes (the release of hormones which helps in the digestion of food) are regulated by the subjective rhythm, one can imagine that there will be a mismatch between the two. The individual that possesses an increased or decreased period could be less fit in the longer run than the individual that does not experience such a mismatch. So the researchers say the circadian rhythm has been shaped by evolution to enable plants and animals to adapt themselves to the immutable cycle of day and night.